Randall Ford’s The Animal Kingdom: A Collection of Portraits is a seamless assimilation of wildlife and striking fine art. This assemblage will not be reminiscent of National Geographic. It does not depict beasts of sorts wandering their habitats, action shots of predators and their prey, or mamas nurturing their young. The first element alerting the reader to this collection’s unique nature is the title. Historically, a portrait is considered a depiction or artistic representation of a person in which the subject’s face, expression, and mood are rendered with the intent of capturing their personality. This is not common to the world of animal photography. Each of Ford’s arresting photos delivers an unexpected sense of connection. Randall Ford’s Dr. Doolittle talent is the ability to capture both what is on the inside and out. Each photo features a close up of a single animal that is accentuated by a stark, unadorned backdrop. The animals appear natural, confident, and almost humanlike in their poses as their pensive faces stare out beyond the page. Who knows if animals truly experience complex emotion and thoughts? Ford’s imagery certainly leads one to believe that they do. 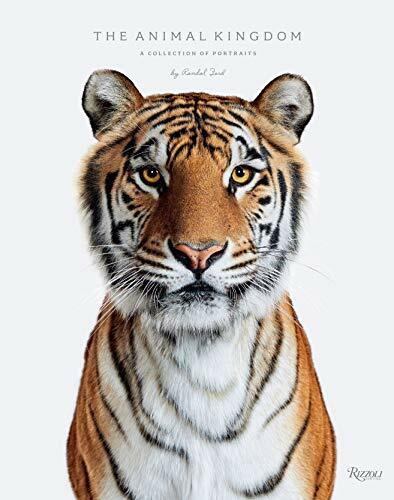 If you love animals and are inspired by fine art, this book is a gem. This collection is elegant, simple, and rich with emotion. As you move through the pages, the rather dapper ostrich standing leaning on one leg, leads to the black swan with the gracefully curved neck. And then there is the somber horse head with braided mane in black background, the thoughtful monkey with chin resting on his hand, and the skunk in black background hardly visible but for the white stripe of fur that curves sensuously through the length of his body. And oh, the pink cockatoo, in profile with that comical look on its face. The Animal Kingdom: A Collection of Portraits will arouse your senses and inspire a new and unfamiliar appreciation for the animal kingdom.